A human-electric hybrid vehicle, the "Imagine PS," capable of 100 kph (60 mph) on the flat and 50 kph uphill, is expected to be commercially available next year. 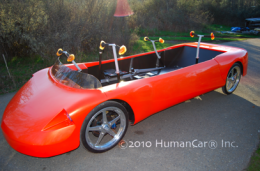 The hand-cranked low mass vehicle (LMV) was developed by engineer Professor Charles Samuel Greenwood, who has been working on human-powered vehicles for over four decades, and has now developed a street legal sedan version carrying four people. If the four people are all cranking, the vehicle can run solely on human power, but it is also an electric plug-in. The chassis can be adapted to different styles and different types of batteries and future technologies without needing to replace the car. The Imagine PS (PS standing for power station) is built by HumanCar Inc.. It can be started by a few backwards/forwards hand cranks, but the company says a senior citizen in reasonable shape would be able to manage the cranking easily, and it can be operated in electric power mode only or any combination of human and electric power. Greenwood said he began working on human powered cars in 1968 as a way to tackle both unhealthy exhaust fumes and the unhealthy and overweight bodies of many of the drivers. Early test devices showed that bicycle style mechanisms would not provide a full-body workout, so the design shifted to rowing-like movements. A range of vehicles has been built and tested since then, culminating in the Imagine PS. The test vehicle is open, but an all-weather roof will be available for the commercially available cars. Also available will be a touch-screen display with GPS and biometric data logging, and computing/communications and sound systems. Safety is provided by a sophisticated structural system and controlled energy absorption areas. The Imagine PS is expected to be available next year with a price tag of $15,500, and pre-orders can be made with a $50 100% refundable deposit. Production will begin when the company has received 800 pre-orders, and it already has over 100. Greenwood said the company is independent and "essentially profitable right now," and they have a 200-year business plan that includes taking human-powered cars to the developing world, along with other products such as a two-person mobile power station that folds into a suitcase. I was wondering why he made it hand-crank rather than pedal style, but he wants a full-body workout. While the idea is nice, not a lot of people would want to do that every day to work. Pedal powered would be the only way this would really come to the consumer market, sadly. Most people would rather just get a bike if they wanted to exercise and get around quick-ish. Still not entirely sure how direction control works. Ah, now when they have a car you can feed humans into, as fuel - then we'll have real human-powered car. Seriously though, do humans produce more useful propulsive energy over a longer period of time via a rowing motion compared to the more traditional bicycle motion? By mechanical advantage, yes. The length of the chain reduces the amount of output power dependant on gearing. In reality due to the fact that a bicycle wheel is constant motion compared to the stroking of an oar, I'm not sure. I'd think the bicycle motion would win out to be honest. It looks nice -- unless it rains -- or unless you need to park it somewhere -- or if you need to take it on the highway. Someone could easily pick it up and throw it in the back of a pickup truck and drive off with it. But I like the idea! Grey bearded creator Greenwood cranks >800Watts compared to Lance Armstrong pedaling 300 max. He could extend that range by paving the skin with PV cells and charging up on a sunny day. Gathering energy while you park. Yep. And little rain drops made the mighty oceans. The Solar Constant is 1350 Watts per square meter outside the atmosphere and 24 hours per day. Right . And some range increase with no compromise to design is infinitely better than none since 1/0 =infinity. With >$300k into concept/prototype the rig has brakes that work. yeah, $10000 for 75 watts. right on. i wonder how much electricity would be made by a busy gym if all the machines were designed to do so,lol..